Taste What Fresh Really Means! 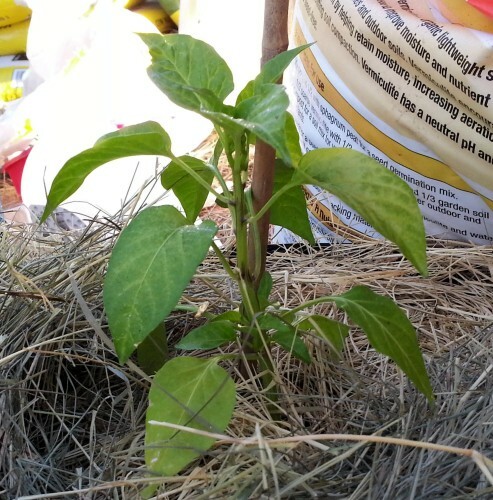 How Not to Water Your Peppers – Don’t Let This Happen to You! 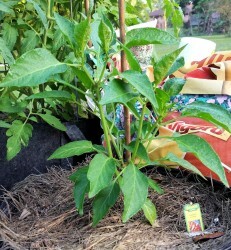 How to water peppers so they live – that was my challenge this winter/spring growing season. It was either too much of a good thing, or something in the water that they couldn’t live with. Fortunately, I think I have saved most of my peppers, although I expect that there is one casualty. So, listen to what I have to say…and don’t let this happen to you! And the video below is probably worth a thousand words. I put out the plants at the tag end of February, and I held back a bit on the water at first. It was so chilly some nights that I didn’t want the plants to get too stressed out. After it warmed up some in mid-March, I started watering more heavily/thoroughly. The soil was nice and moist…when the torrential downpour came. And there was another variable that came into play – the quality of the water. Which is how I almost killed my pepper plants. …too much salt! You see, since we have a water softening system, there was salt in that water. Not enough to taste if you drank it, but certainly enough for the plant roots to notice. And then more water with the sodium, and more…needless to say, the plants did not like it! I first noticed the effects on one of my tomato plants. 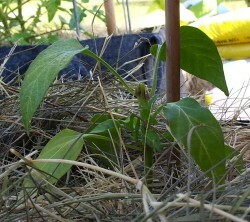 Then, the pepper plants started shouting for some help (in their own way). At first I thought it was too much water — when I stuck in my moisture meter, it showed wet. So, I held back on water. Then when I did water, the now-thirsty roots took in more salt. You’ll see in the video the sad effects on some of my peppers. Now not all the plants suffered as badly; the stronger plants held on somewhat longer than others. It finally dawned on me that we must have some sort of overflow faucet on the well — to catch the water before it went into the softening system. So I rummaged around in the shed where the softening system was and found the faucet. I decided to take a walk through my peppers and show you what I mean. Get out your handkerchiefs! Don’t let this happen to you! How about some before and after photos, so you can see what I mean? To the right is a photo of the plant on March 3. It doesn’t look so wimpy in the photo, but if you had seen it in person, you would have agreed that the name fit! The leaves were light green — not the deeper green that I would like. The stem was also pretty weak. Many of my other plants were flowering and even setting fruit — but not Havsau. 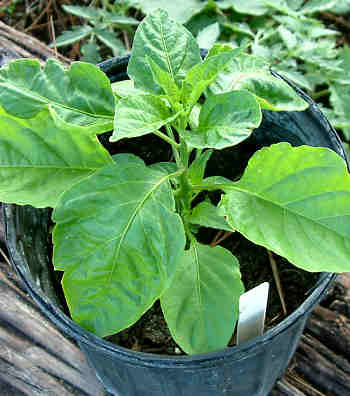 I am growing it in a 5-gallon container, like many of my other pepper plants, and it has a nice rich and loose soil – plenty of compost, too. It just didn’t seem to really catch on like my other peppers. The decision I had to make was – how much to cut off? Should it be just a little, or should I go radical? You might be able to tell from the photo to the left — I decided to go somewhat on the radical side. There were four big leaves left, along with a small leaf or two. Yes, it did look sad — even sadder than before. I started second-guessing myself, if I had perhaps gone too far? I decided to keep it so that it only got about 5 hours of sun a day for the first few days, instead of its usual 8 hours. I didn’t want it to get too terribly shocked at first. Now the theory is that by cutting back the growing tip (the main stem), it forces the plant to bush out and develop multiple stems. The multiple stems would allow the plant to bush out and be stockier. It would also provide for additional points to develop fruits. I haven’t grown this pepper before — I don’t know if I will like the resulting peppers or not — but if not, I have plenty of neighbors who wouldn’t mind some. Plus…I just think a stocky plant is a prettier plant. Three Weeks Later – No More Mr. Wimpy! I took this photo about three weeks later. No more wimpy plant! Instead, it’s growing like no tomorrow. And although you can’t see it from this angle, the plant is developing all kinds of buds. Within a week, I think it will be flower city on this plant. I’ll be taking more photos over the next few weeks, to keep track of its growth, flowering and fruiting. Any More Plants Getting Pruned? You might be wondering if I tried this on any other plants — that maybe this was just a lucky accident? I had a lot of other plants with flowers and fruits, except for one – Cowhorn. So I snipped it back as well. It’s definitely gotten stockier, but hasn’t had the explosion growth that Havsau experienced. On the other hand, the container or location might have something to do with that — the Big Bertha plant in the container with it (they share a 20-gallon container) is also growing slowly. About 10 days ago, my Shishito pepper was looking anemic and had stopped flowering. Sooooooo, I picked off all the peppers (there weren’t many) and snipped it back, although not radically. And today I have flowers and lots of little peppers! Next up is one of my Orange Bell peppers. It has a nice-sized pepper on it, which I will cut off for dinner tonight. And that means tomorrow it’s going to get a trim. The plant is single-stemmed and isn’t flowering, so between taking off the pepper and giving it a snip, I should see some action in the next couple of weeks. 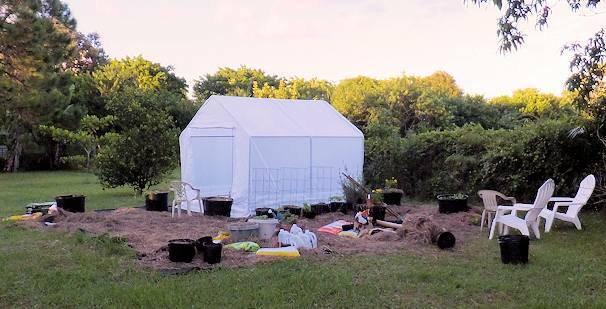 Spring 2016 Garden — What’s Growing? 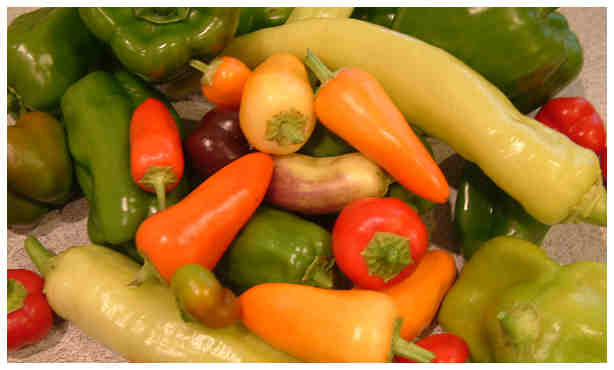 Subscribe to Homegrown Peppers by Email & Never Miss a Post!